SpaceUp is an unconference, also known as a user-generated conference or a BarCamp. There are no spectators at SpaceUp, only participants. 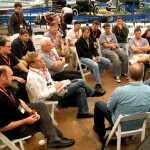 All attendees are expected to give a demo, present a talk, or participate in a panel or roundtable. It’s not as scary as it might sound, though. Sessions at SpaceUp are conversations, just like every conversation you’ve had (or wanted to have) at any other conference. The only difference is that the sessions are planned on the spot, which means we’re sure to be talking about topics we find interesting. On-site registration works a lot like any other conference; you’ll pick up your badge, schedule, and maybe some goodies at the front desk. Name badges are important at SpaceUp. Other attendees are here to meet you, and you’re here to meet them. Your badge will have your name on it (natch), but you should feel free to customize your badge to better reflect who you are. SpaceUp has many sessions going on at the same time. The only way to keep up with them all is the session grid, a giant board with all the available sessions listed on it. The session grid starts out empty at the beginning of SpaceUp; only breaks and Ignite sessions (see below) are scheduled beforehand. 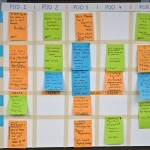 Sessions are proposed by writing a synopsis on and sticking it in one of the slots on the grid. The grid fills up quickly over the course of the morning, but it grows and changes as the day goes on and more ideas surface. A session can take a few different formats: a presentation with Q&A, a demo, a panel of experts, or a roundtable. Some of the most interesting sessions are proposed as open-ended questions. (“Should NASA continue developing hardware?” “What’s the cheapest way to do science in space?”) Project demonstrations make great sessions, too, especially when they’re hands-on. There will be at least one session about SpaceUp itself, to talk about what we can do better, both on the spot and for the next SpaceUp. You’re more than welcome to start other sessions about SpaceUp, especially if you think there’s something wrong. If you’re itching to give a presentation with slides, we have just the format for you: it’s called Ignite. Each speaker gets 5 minutes to talk, with 20 slides that rotate automatically every 15 seconds. 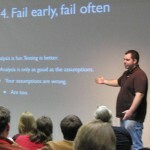 At SpaceUp, we call our Ignite-format talks T minus 5. These are usually the only talks that are scheduled beforehand, because they take a bit more preparation and planning than most unconference sessions. They’re definitely worth the effort. For inspiration, see the awesome talk by Andy Cochrane on why space is boring, or another about how to give an Ignite talk. If you want to take part in a SpaceUp and you can’t be there in person, SpaceUp Stuttgart had a great idea for how to contribute: Send a one-minute video of yourself that they can play to the assembled crowd, just like a mini T-5 talk. Each SpaceUp gets to decide if and when they want to show your video – maybe during the opening session, maybe in with the other T-5 talks – but many of them are more than willing! See @60secondstoland on Twitter for examples. There are lots of sessions going on at once, so there’s no excuse to be bored. More specifically: if you find yourself neither contributing nor learning, it’s your responsibility to get up and find (or create) a place where you can contribute or learn. If no one is asking the question you want answered, write it up as a roundtable discussion. If no one seems to share your interest in parametric models of rocket nozzle design, start a session and see who attends. If all else fails, go get a snack and listen in on the conversations there. Food is important. BarCampers (and SpaceUp…pers?) are like hobbits when it comes to food and drink. There will be plenty of it, and it’ll be available at all times. Our breakfasts start early, our lunches are long, our dinners are raucous, and there are plenty of snacks to be had in-between. One thing we ask, though: if you find yourself having a fascinating conversation over snacks or drinks, think about adding that topic to the session grid so other people can join in. If you found it exciting enough to talk around a sandwich, there’s bound to be someone else who wishes they could join in. This may sound like a lot to take in, but you’ll get used to it in no time at all. There will be plenty of unconference veterans on hand to help out, and we’ll have a whole group of volunteers to help keep things moving smoothly. If you don’t have time to prepare anything before you go to SpaceUp, don’t worry. Just be there in time for the opening session and you’ll have plenty to do and contribute. If you want to prepare a talk beforehand—and it isn’t an Ignite talk (see above)—write it up as a set of notes or questions instead of a formal PowerPoint presentation. Do bring props, posters, diagrams, or demonstration equipment if you have it; just don’t assume that there will be audiovisual equipment to use. If you have a panel idea, definitely talk to other attendees you know and get them involved. The more people you have on your panel when you propose it, the more attractive it will be to other attendees. If you’ve read this far, you’re practically a SpaceUp veteran already. We hope to see you there! Like BarCamp and other unconferences, SpaceUp is designed to be copied and adapted for different places and special topics. If you’re interested in organizing a SpaceUp in your own city, have a look at these simple steps and/or contact us and we’ll do what we can to help you get started.